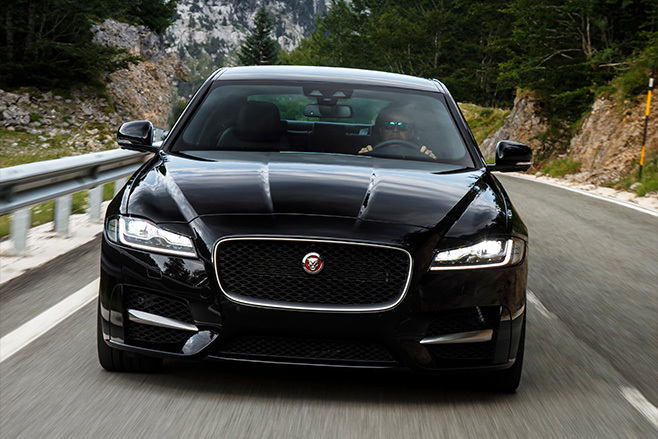 The first Jaguar XF gave the brand a new identity. Now, the XF has been given an identity of its own, for a more targeted assault on opposition such as the BMW 5 Series and Mercedes C-Class. This is the all-new XF, the car that sparked a revolution in Jaguar design when it landed in 2007 and has set the tone for the look, feel and ethos of the brand ever since. This is the first global opportunity to drive the new XF, which has a platform that also underpins the new Jaguar XE (which is BMW 3 Series size), and will also be used for the Jaguar F-Pace SUV that will be unveiled in production form at the 2015 Frankfurt motor show. The XF will also show whether, now that Jaguar has gathered some steam, it can maintain momentum. A superbly balanced car that has sharpened its focus as a proper rival for the Germans. Handsomely styled, it is loaded with gear and is safe and entertaining to drive. Price will determine its competitiveness, yet it’s a clear step forward. THERE’S a time for revolution. That time for Jaguar was 2007, when Ian Callum’s boldly styled XF set the tone for a rebellious, resurgent brand. Now, the second-generation XF sets out to prove it can beat second-album syndrome. The success of that first XF enabled Jaguar to build the smaller XE. Ironically, that has given the XF a new and clearer identity. It’s no longer the entry-level Jaguar chasing buyers across segments; the XE now stalks BMW 3 Series buyers, leaving the XF to hone in on the 5 Series and Mercedes E-Class. The exterior may look like Callum has been lazy, but XF version 2.0 reflects the company’s progress since ’07. The XF looks bigger, but it will fit in a smaller parking space. The wheelbase is 51mm longer, but at 4954mm the new car is 7mm shorter. Overhangs have been reduced, while a more upright nose and lower ride height deliver strong presence. 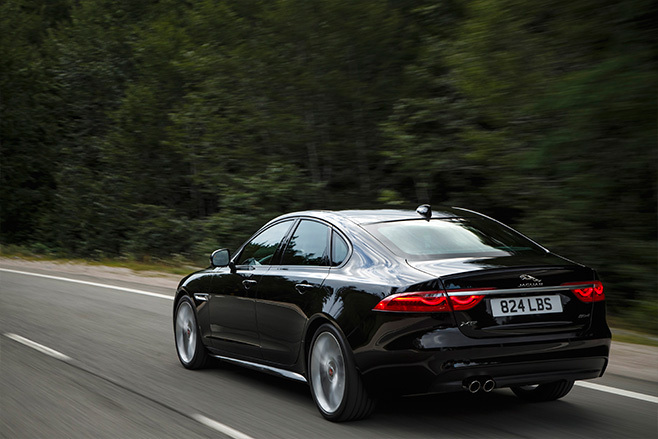 The wheelbase growth translates into greater cabin space, immediately apparent the instant you slide into the XF. In the back, there’s more knee, leg and headroom, and it’s far easier to climb in and out of, feeling more like a shrunken XJ than a long XE. There’s also a 540-litre boot to match the best in class. The XF also scores the latest infotainment system, with an optional 10.2-inch touchscreen (called ‘In Control Touch Pro’) complete with crisp digital instrumentation that enables navigation to cover the entire cluster. It offers customisation, finger-swiping and even the ability to unlock the XF via smartphone. The bad news? You’ll have to wait until mid-next year for it, as it won’t be in cars built before December. Meanwhile, the XF’s signature rising gear selector remains, as do the folding air-vents. Sadly, the standard 8.0-inch centre screen has pushed the air-vents higher, so the middle ones don’t fold – only the outer vents do, which look cheap and last-minute, at odds with the rest of the interior’s premium feel. Our test car is a Jaguar XF R-Sport, which sits above the entry-level Prestige but below the Portfolio and flagship S, with Australian spec and pricing yet to be confirmed. Of the five drivetrains offered, we’re testing the new 132kW/430Nm ‘Ingenium’ 2.0-litre four-cylinder common-rail turbo-diesel – the only new powerplant, as the rest of range uses carry-over engines for now. It is linked to an eight-speed automatic. The Ingenium leaves the 2.2-litre diesel it replaces for dead. It’s well-mannered and doesn’t sound at all like a diesel. While there’s some lag, it pulls strongly and smoothly from 1750rpm while producing a gruff, not unpleasant note. With this more efficient engine and a body that is 190kg lighter – it’s 75 percent aluminium and 28 percent stiffer – fuel consumption drops from 5.2 to 4.3L/100km while the 0-100km/h sprint is cut by four tenths to 8.1sec. Engine refinement is complemented by a well insulated cabin and a transmission that’s smooth but can’t quite keep up with your fingers when you’re flicking the wheel-mounted paddle-shifters, even in the Dynamic driving mode. Our R-Sport test car runs firmer passive dampers on the same double-wishbone front suspension and integral link rear as the brilliant XE. The result is just as convincing. On 20-inch alloys, the XF soaks up bumps and stays as composed as a Beefeater regardless of the surface below, helped by the standard torque vectoring. There’s ample feedback through the electric steering (also taken from XE) and, while it’s quite heavy, it’s precise and accurate. The XF is supremely balanced. Without confirmed prices, it’s difficult to say how hard the XF will punch when it lands here in December. Regardless, like a brilliant follow-up album, this car cements Jaguar’s talent.